There's a disappointing lack of The Avengers, but the finale of the Monsters Unleashed crossover is still full of all-ages, action-packed thrills. After five issues, and numerous tie-ins, Marvel’s latest crossover event, Monsters Unleashed comes to end with this final showdown between Earth’s Mightiest Heroes and the monstrous army of the Leviathan Mother. 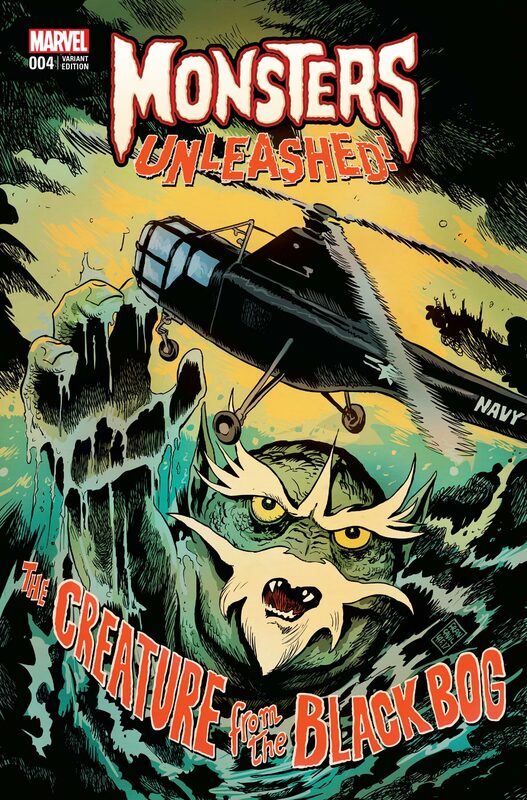 Just like the other issues, the grand finale isn’t going to blow you away with its meticulous plotting or depth of characterization, but if you’re in the mood for massive monsters slamming into each other, then there’s much to enjoy. After the arrival of the Leviathan Mother on Earth at the end of issue #4, the heroes protecting New York have fallen and it’s all up to Kei Kawade, the Inhuman boy prophesied to defeat the Leviathans, to save the world. It’s a bit disappointing that the Avengers hardly feature in the book, as they’re hopelessly out of their depth with the Leviathan Mother. Apart from obviously wanting to see more of our heroes, the banter from the likes of Spider-Man, Rocket Raccoon and Totally Awesome Hulk has been one of the highlights so far. Still, at least Kei Kawade is a likeable replacement protagonist. Now going by the name Kid Kaiju, Keiwade is a welcome new addition to the Marvel universe. His band of motormouth heroic monsters are also fun new creations – namely, Fireclaw, Slizzik, Scraag, Mekra, Aegis and Hi-Vo. A bunch of tigers, robots and reptiles, they look just like your childhood scribblings come to life – which is exactly what they’re meant to be. There isn’t a lot of room to flesh them out here, but writer Cullen Bunn does give them vaguely different personalities through their different speech patterns (one speaks in the first person, another in synonyms, etc.). His plotting is fairly predictable, though, as the twist that Kei’s monster doodles would come to life and save the day has been heavily telegraphed for the past couple of issues. Still, at least the writer has some fun with the series’ influences. Monsters Unleashed has always been inspired by Kaiju movies, but issue #5 looks to another piece of Japanese-themed entertainment for inspiration. As Kaiju combines his six monsters together into one giant creature, you can’t help but be reminded of the Megazord from Power Rangers. Funnily enough, the resulting monster even looks a little like the Megazord from the new Power Rangers reboot. The latest and last of the revolving door of artists on this book is prolific artist Adam Kubert. His detailed, highly-stylized technique fits in with the look of the previous issues extremely well and he’s a natural at the action sequences, ensuring that they’re kinetic yet easy-to-follow. The page layouts are often fresh and dynamic and there are several awesome splash pages peppered throughout. When the storyline is as action-packed as this, it’s all on the artist to make it work and Kubert, just like the previous pencillers, definitely delivers. 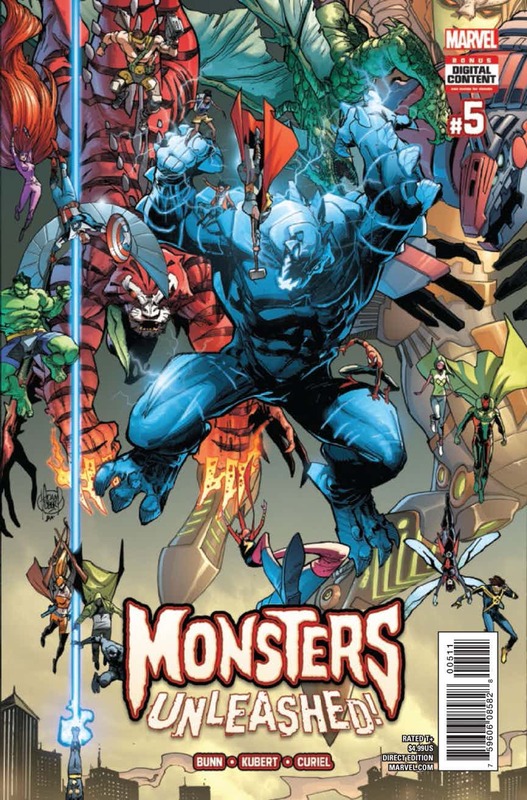 The Monsters Unleashed crossover might have had its ups and downs, and some readers might have been after something more mature, but the final issue encapsulates the all-ages, action-packed thrill of this miniseries, which aims to rekindle the monster-loving child within. 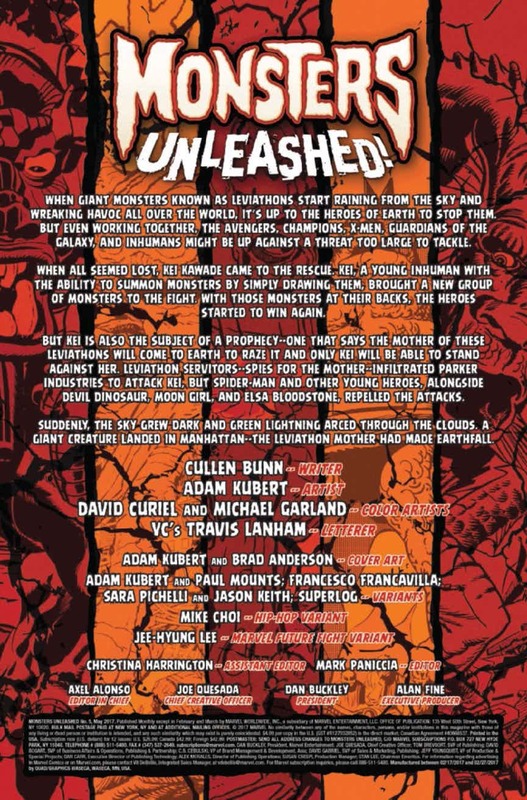 Best of all, it ends on a note that leaves you hungry for more and eager to pick up the new ongoing Monsters Unleashed series.